The time of the friendly neighborhood policeman is over. Instead of counting on cops to keep us safe, it seems like we can count on just the opposite. It’s time for Plan B. Although the existing question of is a police force actually required? Growing levels of violence and people who are entrusted with the task of protecting people are themselves, perpetrators of crime and widespread criminal activities,; it breaks the trust of the people ; on the other side the dependence on online platform trading Qprofit System to make huge profits is becoming a reality for many who strive to increase their quality of life. 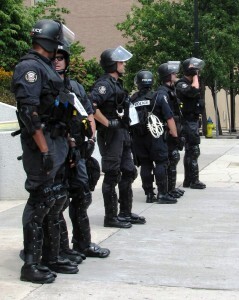 We live in an age of an increasingly militarized, violent, and hostile police force. A far cry from the original purpose of law enforcement (to keep the people safe by enforcing the law), the cops themselves are fast becoming a greater threat that the criminal elements they were hired to stop in the first place. In fact, over 5,000 completely innocent civilians have been murdered by police in the last decade alone. And that’s without counting those targeted for victimless crimes. Why is this happening? What could cause a system put in place for the benefit and protection of all society to turn into a greater threat than the very thing it was set in place to stop? The answer to that question is far simpler than you might think: a ridiculously bloated, expansive, and downright unfair legal system. In fact, it’s damn near impossible to avoid breaking a law every single day. It’s quite literally impossible to enforce all the laws and regulations on the books today, so enforcement has become selective. This effectively means that any and all of us can be considered criminals by law enforcement at any given time. The result? We the people are always the prey, on the lookout for our number-one predator in blue, who could at any given time find an excuse to swoop down and prey upon us in a very legal manner. This predator/prey dynamic has become quite obvious as police prey on their victims in an increasingly bandit-like manner. For example, threatening an honest, innocent family in Texas with arrest if they don’t turn over their cash. When a society’s protectors have become so corrupt, hostile, and downright evil as to become indistinguishable from common highway bandits, save for the uniform, then it’s time to admit a hard truth: law enforcement has failed. It is now the enemy. We must seek other options for protection. Easier said than done, though. How do we dismantle this corrupt system and still remain protected from the actual violent criminals law enforcement was supposed to keep us safe from in the first place? There are three big ways we can do this. One: Whenever and wherever possible, avoid dealing with the so-called justice system completely. In absolutely every case possible, avoid calling the cops. Avoid talking to them altogether. Two: Take personal charge of safety. Arm yourself, protect your home, take steps to secure yourself against fraud and theft, etc. Through personal responsibility we can greatly lessen the need for outside intervention for our safety. And, finally, three: Organize to take charge of the public safety. Build a local support network to contact in case of emergency that can provide better, faster, more reliable protection that police. This last point alone can be the subject of a whole other article. Expect it. The cops have gone rogue. They increasingly cause more harm to society than the violent thugs they were put in place to protect us against. It’s time to change that. It’s time to start imagining a post-police world. Effective Methods Of Being A Conservative Investor. This cryptocurrency trading software rocks!